Get started now for as low as $30/month! Excellent service and friendly technician. We had a horrible problem with spiders and within two days they were gone. I highly recommend Triangle Pest Control. I just recently signed up with Triangle to take care of the pest control needs for my home. Every interaction I've had has been professional and very customer service oriented. I've been very pleased with your bed bug service. We love calling North Carolina, South Carolina, and Colorado our homes. Here at Triangle Pest Control, we have worked for over a decade to provide you with the most comprehensive, prompt, and professional pest control services in the area. 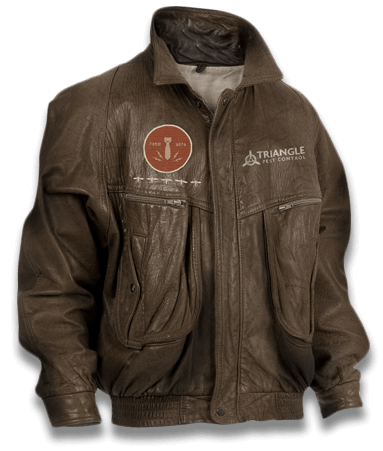 Think you have what it takes to wear this jacket? If you have a pest emergency or just want to hear a friendly voice please contact our main office at 919-926-9527.